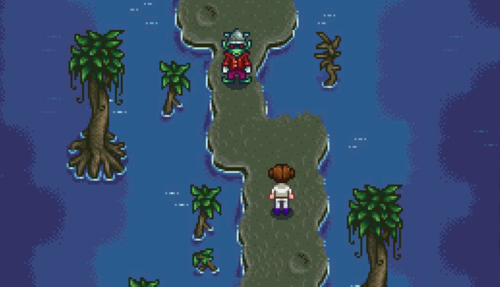 The Witch's Swamp is a location that becomes accessible after completing the "Dark Talisman" Quest, which becomes available after completing the Community Center Bundles or the Joja Community Development Form. The cave which leads to the swamp is located in the northeast part of the Railroad area. The Witch's Hut is found past the Witch's Henchman. Once inside the Witch's Swamp, the Witch's Henchman will be blocking the way to the Witch's Hut. He will only allow the player to pass if he is given Void Mayonnaise, which also completes the quest Goblin Problem. Recover the Magic Ink inside the Witch's Hut, then bring the ink back to the Wizard, who will unlock four Wizard buildings for The Farm. In the Witch's Swamp you can catch Void Salmon and Void Mayonnaise by fishing. There is a 25% chance of catching a Void Mayonnaise while the Henchman is guarding the Witch's Hut. You can also catch Green Algae and White Algae. Catfish can also be caught in the Spring, Summer, and Fall. This page was last modified on 16 March 2019, at 19:24.